I’ve spent the winter in a Monastery. Well, cuisine-wise anyway. In search of inspiration during a seasonal chef’s most challenging months, I discovered Simplicity from a Monastery Kitchen: A Complete Menu Cookbook for All Occasions. Brother Victor-Antoine d’Avila-Loutourette, whose origins are obscure and whose abode is in upstate New York, has written many monastic cookbooks. 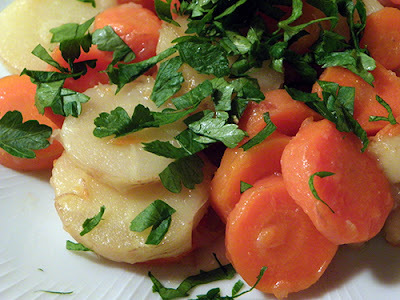 My blog features only one parsnip recipe: delicious, nostalgic oven braised parsnips and carrots. So it's Brother Victor-Antoine to the rescue with parsnips in a sweet, buttery glaze spiked with dry mustard. Like several of Brother Victor-Antoine’s recipes, this is not light fare. If California monasteries are any indication, the New York monks need those calories to stay warm in winter. Though I typically lighten up recipes, I reduced the butter only slightly, to the ¼ cup amount that matches the maple syrup. The flavor is divinely balanced—and the proportion easy to remember. I increased the mustard, and might double it again next time, or substitute powdered ginger or sweet spices like cinnamon and nutmeg. 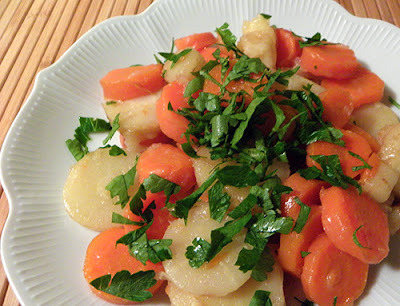 I might also try this recipe with yellow beets or cubed sweet potatoes. With the first of the year’s Farmers’ Markets beginning next month, we’ll soon have more veggies to choose from. 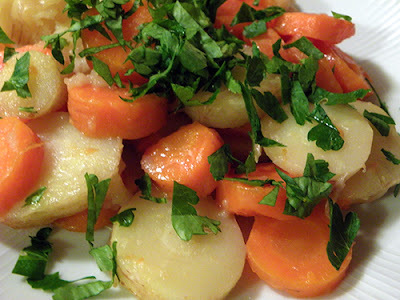 But meanwhile, let’s honor the humble root veggies, as we celebrate the official beginning of spring. 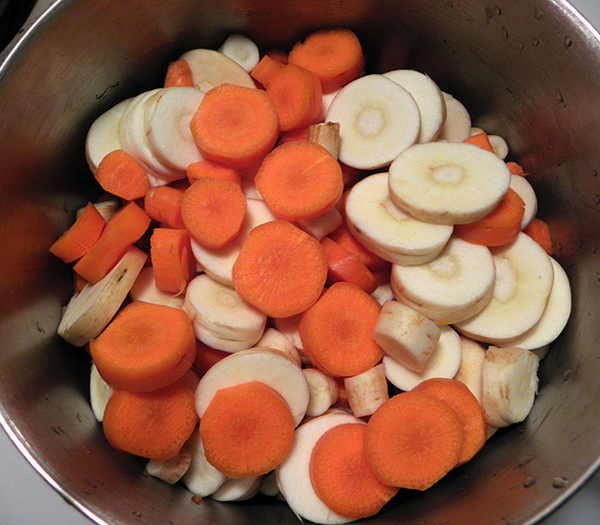 Scrub and trim the parsnips and carrots. Peel the carrots, but do not peel parsnips. Slice into even rounds about 3/8 inch thick. Place in saucepan. Add water and bring to boil. Add the salt and sugar. Reduce heat to medium-low. 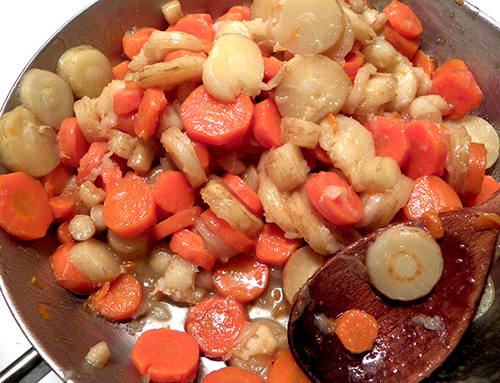 Cover and simmer gently for 15 – 20 minutes. Drain and keep warm. Melt butter over medium heat in large saucepan or skillet. Add maple syrup and dried mustard. Mix well with wooden spatula. Continue heating and stirring until mixture becomes a blended sauce. 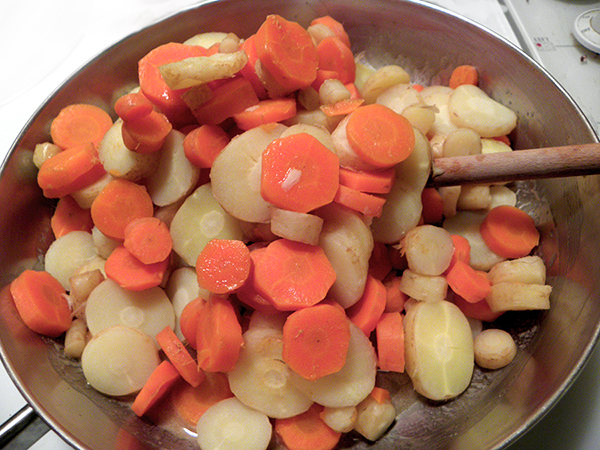 Add parsnips and carrots, and gently toss with sauce until well coated. Serve immediately, garnished with finely chopped parsley or chervil.